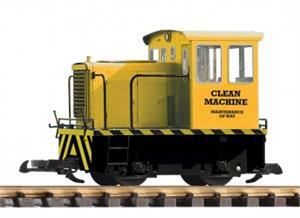 With the “Clean Machine“ version of the GE 25-Ton diesel, PIKO introduces a completely new concept in track cleaning. Common household rechargeable batteries provide extensive running time. Track cleaning operation is simple - just turn it on and let it run around the layout until even heavily oxidized track is polished clean. Once the CleanMachine has cleared the way, track-powered locos can run smoothly.